PELOPONNESOS. ARGOLIS. Epidauros. Circa late 280-260 B.C. AR hemidrachm. 2.64 gm. 15 mm. Laureate head of Asklepios left / EP monogram within a wreath;. SNG Cop 116. BCD Peloponnesos 1232-3 (same dies). Very Fine; good portrait, well centered; attractive old cabinet tone. Interesting four-point star countermark or punch on reverse. Rare. 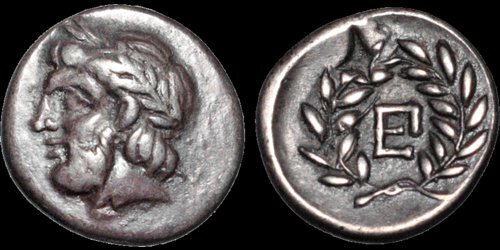 The early Hellenistic coinage of Epidaurus is a very small issue and very rare. Epidaurus, a small city in ancient Greece on the Argolis Peninsula, is considered the birthplace of Asklepios, the god of healing. Just south of the city was the Asklepieion, a massive healing center, sanctuary, temple, hotel and theatre, and the site of Panhellenic games. Their ruins remain a popular tourist destination today, and in fact the theatre, noted for its symmetry, beauty and exceptional acoustics, is perfectly preserved and still in use today.